In Steuart Pittman’s experience, Americans love racehorses. They’re just unsure about the rest of it: are the horses “abuse victims” on the track and after they retire, are they suitable for riding by anyone other than daredevils? The longtime trainer and breeder at the storied Dodon Farm in Maryland seeks to demystify the racehorse through a new initiative. Unveiled at the Maryland and Pennsylvania Horse World Expos at the beginning of the year, the racehorse project drew 350 people to one event alone, evidence to Pittman that there is a huge demand for better understanding of the racehorse and best training practices. That initial success is fueling his efforts to create a central repository for training, educational information, forums, and just about anything else one needs to know about transitioning a racehorse to another discipline. There is so much that is misunderstood about an ex-racehorse. Not “crazy,” the breed is actually very clever and soaks up training. “An honest assessment of the Thoroughbred temperament” shows them to be “extremely trainable because they have active minds and active bodies,” says Pittman, a longtime eventer who believes riders of all levels and disciplines can make great partners of Thoroughbreds. It’s often easier to ride a mount who doesn’t have to be kicked into moving forward, he says. A rider who spends less time trying to move the horse has more chances to learn important balancing skills, he says. On a naturally forward Thoroughbred a rider can focus instead on learning to have quiet hands and a correct seat, he adds. Through clinics, lectures and other educational outreach offered through the Retired Racehorse Training Project, Pittman hopes to usher in a new awareness of the breed’s potential. 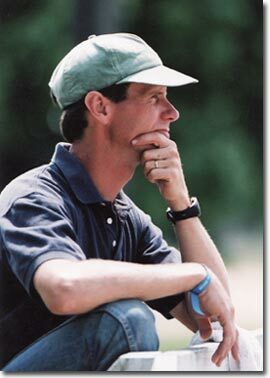 Pittman is among the country's top trainers, certified to teach through the preliminary level. It’s not just the Olympic success stories that win the day, he says. 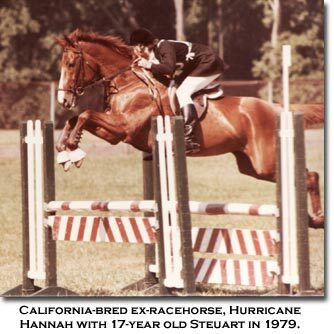 While most know about ex-racehorse Thoroughbred Keen, who Hilda Gurney trained to become a top US Grand Prix dressage horse, and Idle Dice, who became the best US jumper of his time under Rodney Jenkins, there are so many instances of ex-racehorses becoming top performers and exceedingly fun mounts. 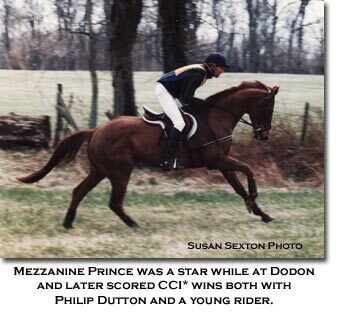 Pittman quotes top-eventer and trainer Jim Wofford as saying the difference between a Thoroughbred and a non-Thoroughbred was the difference between work and play. The non-Thoroughbreds made him work for his living. Awareness of the breed continues to grow through the Internet, which provides forums and information about ex-racehorses, and the work of placement organizations like ReRun, Inc., Thoroughbred Placement and Rescue, and CANTER. This is all generating a positive buzz he hopes to harness as he builds his racehorse project. As one of three generations living and working on a 550-acre tract of land in Davidsonville, Maryland, Pittman’s family and personal roots are deeply intertwined with the land and with horses. His years of horse training and breeding experience are now focused on breathing new life into an offshoot of horse racing. I galloped horses on many a racetrack for many trainers, in many states. I now live in Naples Fl and heard about this website from a friend. I don’t own a horse at the present time, but am more than willing to devote any time, or help wherever needed . This is a great thing you are all doing, and if I can help in any way, let me know whats going on in south Fl. This makes me extremely happy. 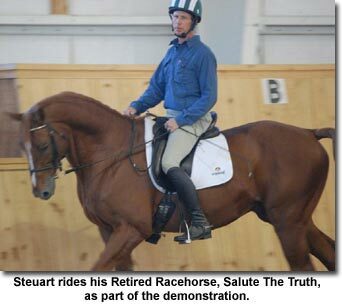 Steuart Pittmann has gone above and beyond for the Thoroughbred, and I hope that he is recognized not just by sport organizations but also the racing industry in the future for the work he is doing as an ambassador and a teacher. Love this story and effort. Keep up the good work! Thanks for the great post, Susan. What’s more versatile, intelligent, athletic, and used to being trained and handled by people than the thoroughbred??? I can think of no other horse more suited to retraining and contributing in second careers.